Over 100 000 visitors will have seen the beautiful exhibition of 28 paintings by Monet at the Musee des Impressionnismes Giverny. The exhibition started on May 1st ends on Saturday 15 August. 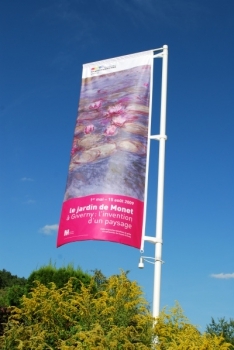 It will have met all the expectations by attracting crowds of Monet lovers in the village where the canvases, mostly featuring Nympheas, had been created. The next exhibition opening on 23 August is dedicated to the oversized and colorful paintings of American artist Joan Mitchell. Joan Mitchell, a master of expressionism, was inspired by Monet’s Nympheas. She lived for years in Vetheuil, her studio neighboring Monet’s house on the river side. For the museum, it will be sort of a flash-back to its origins. Before becoming the Musee des Impressionnismes Giverny, it used to be the Musee d’Art Americain Giverny.